Brain Factory – A unique, innovative and creative reality full of the endless desire of research. 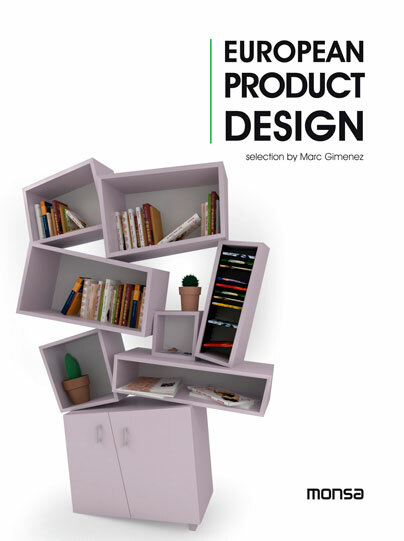 The Scent of garden Apartment, located in Rome Italy, is published by Home DSGN. The Monolithic House, the creative apartment located in the southern Italy, is published by Homedesignlover. “In designing an interior, there is always a focal point. It differs from one home to another and from one space to another. But for some homes, they create something that would be the center of attention of the entire dwelling. 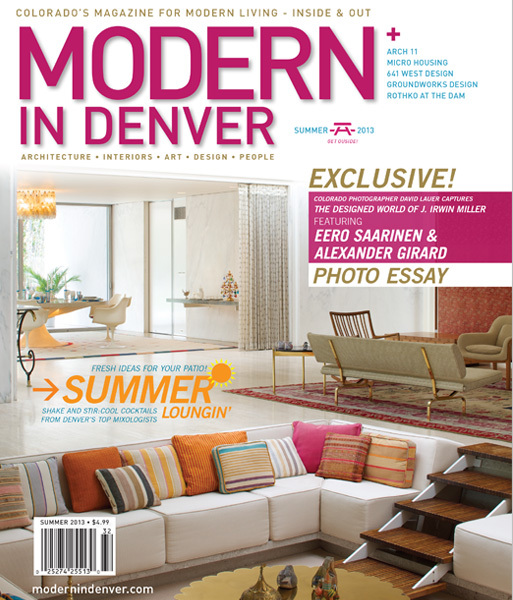 I have seen some spaces wherein the highlight is a sculptural wall system that has different functions. Some has a huge block that would hide some areas of the home like a closet, bathroom and others. While there are also homes that have a huge lovely partition just like this apartment that we will feature today. Monolithic House in the Italian town of Castrovillari, Italy is a 1,830 sq ft apartment that has a monolithic block which is the main focal point of the home. It is a stone wall partition between the kitchen and living room and is characterized by a window which performs the dual function of table or support plane. The interior has a modern minimalist approach and is characterized by visual diversity. When you enter the house, you will be welcomed by a surreal atmosphere with a rain of Swarovski crystals on the walls. You will also see a wallpaper filled with letters on one part of the wall. Check out the images of the apartment below. The Scent of garden Apartment, located in Rome Italy, is published by Home Adore. The Monolithic House, the creative apartment located in the southern Italy, is published by Fresh Home. The Monolithic House, the creative apartment located in the southern Italy, is published by Home Adore. This private residence located in Rome, that expresses with elegance its austere and minimal interior, is published by KARMAN. The Monolithic House, the creative apartment located in the southern Italy, is published by KARMAN. Refeições ao ar livre podem ser uma ótima solução de fim de semana, mas tem sempre um grande inimigo: o vento. Copos, pratos ou talheres de plástico dificilmente resistem a sopros mais fortes. O Bye Bye Wind é feito a pensar nisso, com um design simples mas incrivelmente eficaz. A criação é da dupla de designers italianos Marco Marotto e Paola Oliva e consiste em um conjunto de mesa e cadeiras que resolve o problema do vento. A mesa vem preparada com aberturas do tamanho de copos, guardanapos, garrafas ou pratos de plástico. Na parte de trás das cadeiras, vem também um espaço para colocar objetos, que podem ser bolsas ou casacos, mas que serve principalmente para que os celulares fiquem fora da mesa e as pessoas possam se concentrar no convívio. The submission “TOTAL- régénération” on www.jovoto.com won the second winner place in the “TOTAL Innovation Station” project. The submission “Audinì” on www.jovoto.com won the first winner place in the “Audi – Light follows function” project. 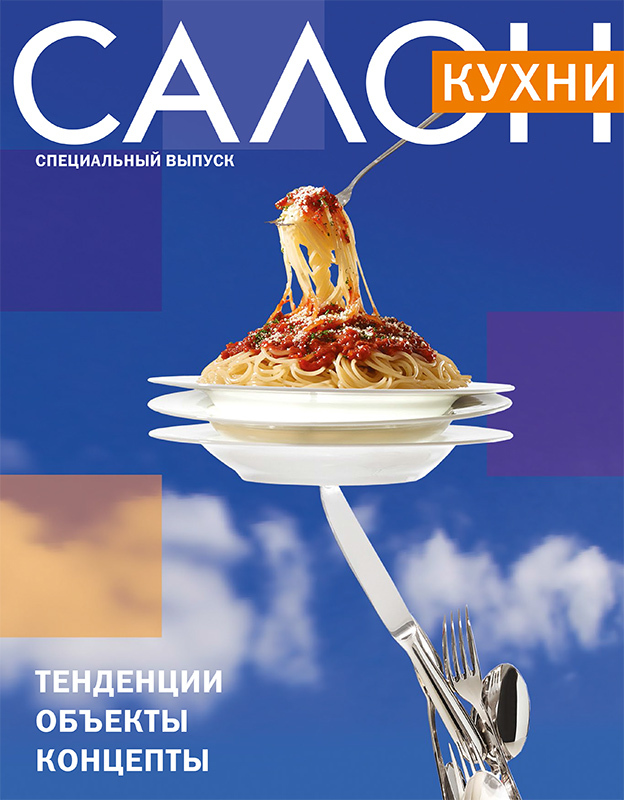 Our outdoor table designed for “Garden Unique” is published by “Salon” Magazine, September’13 Cover on September 2013 at page 30. Пикники на природе и обеды на открытой террасе – это те приятные вещи, за которые мы любим теплое время года. И они были бы еще приятнее, если бы не ветер,норовящий унести со стола салфетки и скатерть, а иногда даже посуду. Бороться со стихией взялись Марко Маротто (Marco Marotto) и Паола Олива (Paola Oliva) из итальянской студии Brain Factory. Они создали стол, в котором есть специальные углубления для посуды. Комплект включает также стулья, на спинках которых есть карманы для разных мелочей. Название объекту дизайнеры дали весьма самоуверенное: «Пока-пока, ветер». 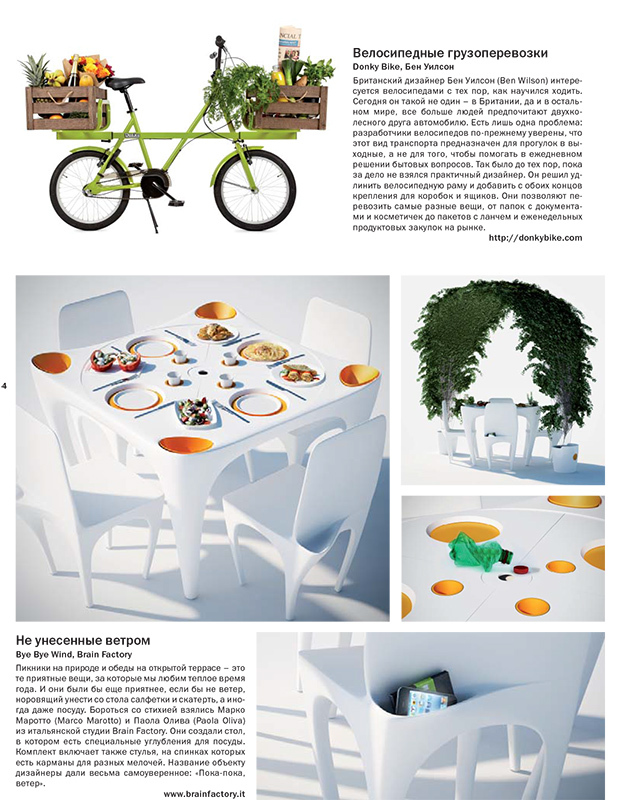 Our outdoor table designed for “Garden Unique” is published by “Exame.com”. Quando se imagina uma refeição ao ar livre, os pensamentos se enchem com imagens de filmes e fotos lindas, onde tudo dá certo. Todos sentados na grama verde, os pratos e copos nos lugares, o ventos esvoaçando nos cabelos. Quem acampa ou faz pic nics por aí, sabe que não é bem assim. O vento em especial, dependendo da intensidade pode ser a principal dor de cabeça. A comida esfria, cabelos não param quietos entram nos olhos e bocas, sem falar dos pratos e copos, quando de plásticos não resistem a um sopro mais forte. Já que a natureza é inevitável e implacável, os designers italianos Marco Marotto e Paola Oliva criaram um conjunto de mesas e cadeiras à prova de vento, resolvendo o problema, sem perder o charme de comer ao som dos pássaros e mesmo, do próprio vento. O Bye Bye Wind (Adeus Vento) traz uma mesa que tem aberturas para copos,guardanapos, pratos, talheres e mesmo garrafas. Só encaixar e relaxar, porque nada vai voar. Nas cadeiras, na parte traseira tem um esconderijo para colocar objetos pequenos, como celulares, assim todos se concentram no que realmente vale a pena: o encontro e o bate papo entre amigos ou familiares. Dining outside is one of the things we love about summer. The setting sun, sound of crickets and gentle breeze. But sometimes that gentle breeze just keeps blowing and along with it, our plates and cups. 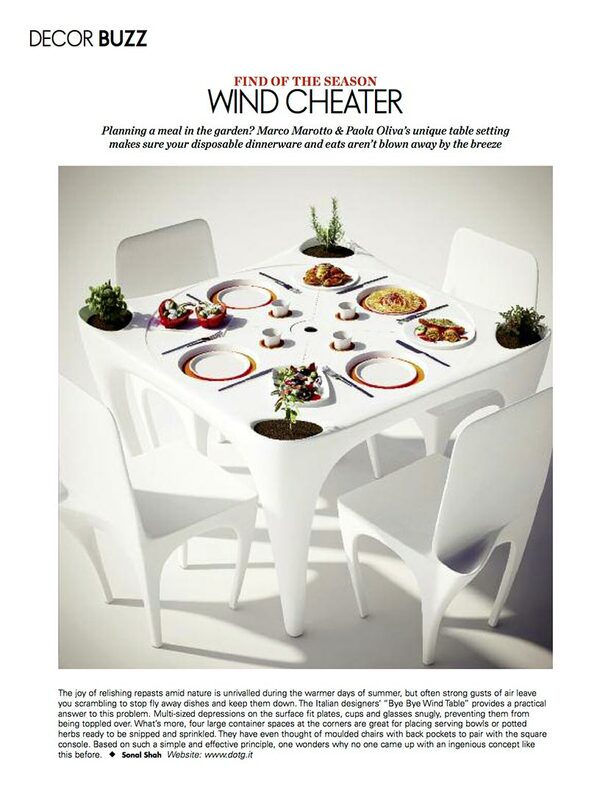 Bye Bye Wind is a concept piece by Marco Marotto and Paola Oliva that aims to solve our high flying dinner woes. The fluid form of the table and chairs seem ready to protectively brace against any rush of air. 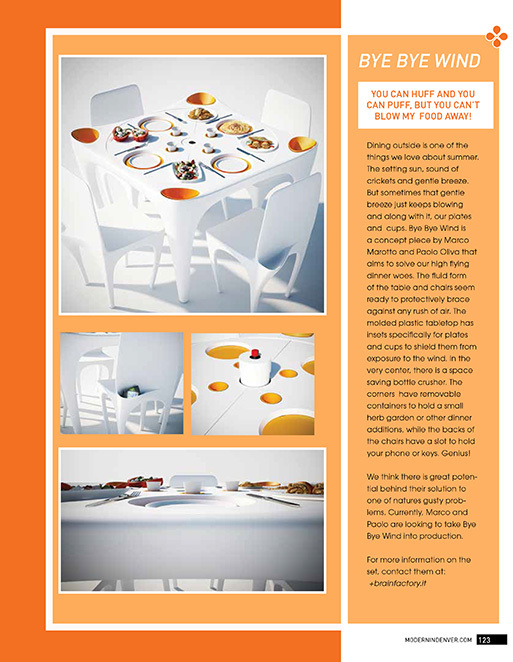 The molded plastic tabletop has insets specifically for plates and cups to shield them from exposure to the wind. In the very center, there is a space saving bottle crusher. The corners have removable containers to hold a small herb garden or other dinner additions, while the backs of the chairs have a slot to hold your phone or keys. Genius! We think there is great potential behind their solution to one of natures gusty problems. Currently, Marco and Paola are looking to take ByeBye Wind into production. 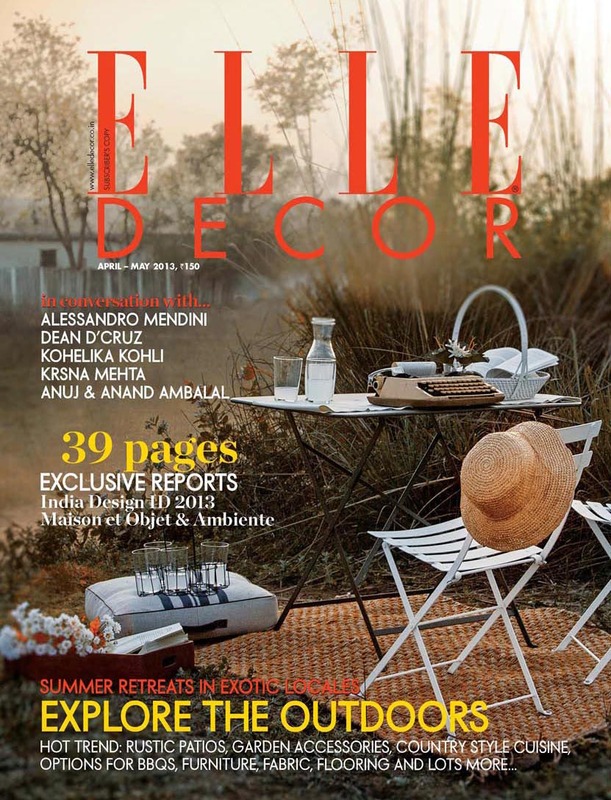 Our outdoor table designed for “Garden Unique” is published by “Elle Decor” India April-May’13 Cover on april/may 2013. Marco Marotto & Paola Oliva, table Bye Bye Wind, prototype. The submission “Audrella” on www.jovoto.com won the first winner place in the “Audi-Family On Board” project. The idea was licensed to Audi. The submission “Cuddle Glass” on www.jovoto.com was licensed to Audi through “Family On Board” project. The submission “Modula” on www.jovoto.com won the fourth winner place in the “The Coworking Challenge” project. BEST HOUZZ 2019 - Brain Factory - Architecture & Design is pleased to announce that for the third consecutive year the firm has won the Best Houzz 2019. BEST HOUZZ 2019 - Brain Factory - Architecture & Design è lieta di annunciare che per il terzo anno consecutivo lo studio si è aggiudicato il Best Houzz 2019.